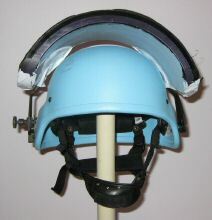 Designed by Orlite of Israel. 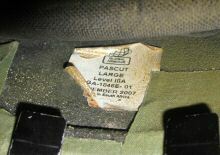 This example - with the liner rivetted to the shell - is actually an Israeli-supplied export model. 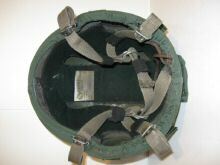 South African made examples have the liner bolted in, along with some other variations to the interior fittings. 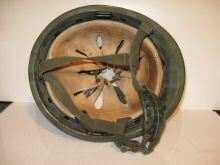 See Joseba's webpage here for pictures comparing and contrasting the Israeli and SA-made M83, including disassembled parts. 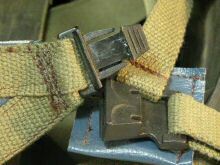 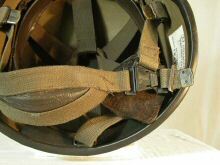 The essential differences are - slotted bolts rather than rivets for liner, and a simpler chinstrap with no plastic catch, just friction buckles. 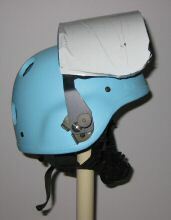 For more photographs, including disassembled parts, see Joseba's webpage here. 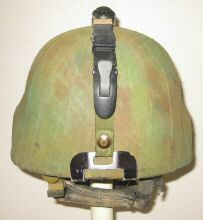 M87 - variant with mounting for faceshield. 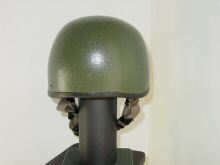 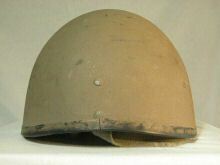 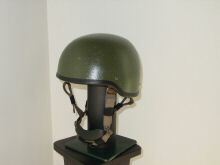 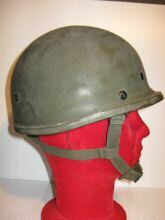 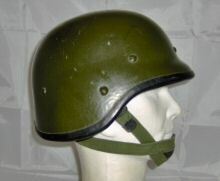 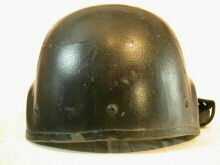 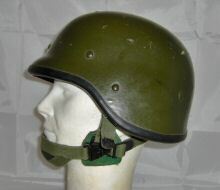 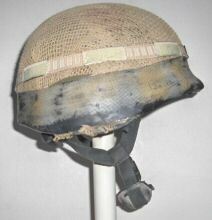 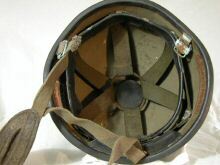 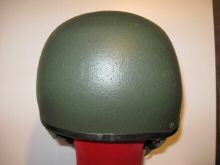 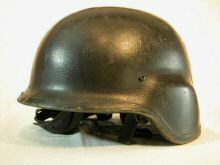 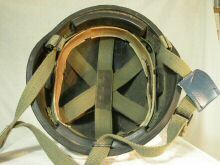 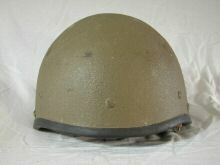 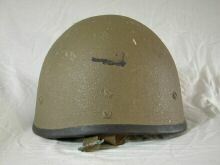 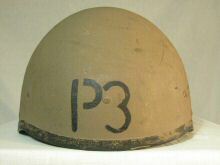 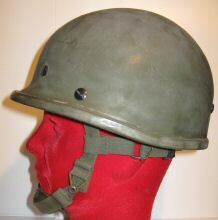 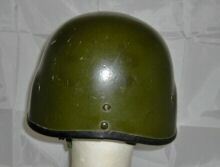 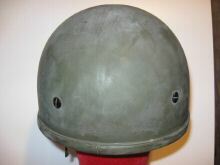 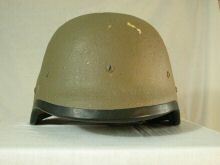 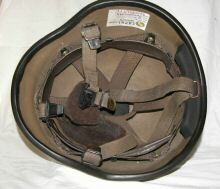 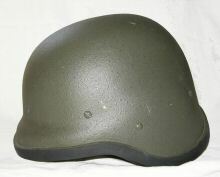 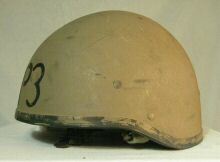 Some later production helmets were fitted for use with a faceshield. 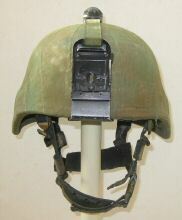 The only other noticeable difference is a small change in position of the side chinstrap bolts. 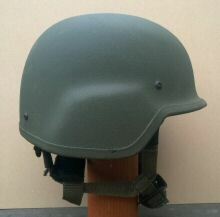 M87 clone? 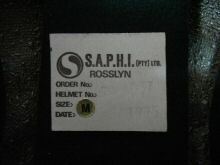 - produced by South Africa? 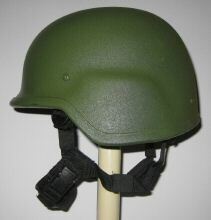 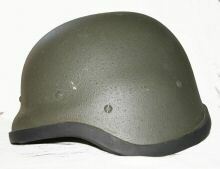 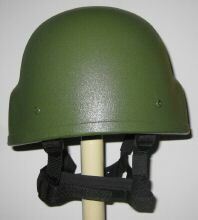 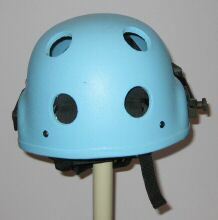 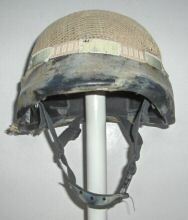 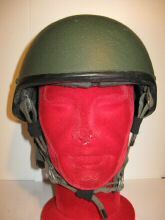 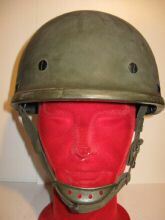 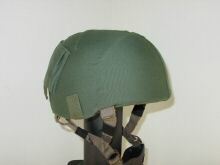 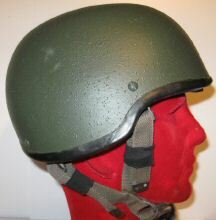 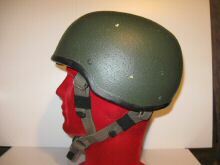 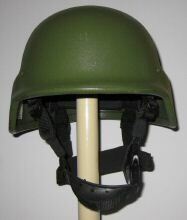 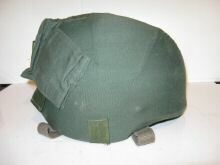 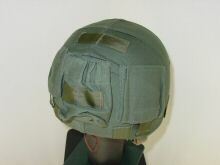 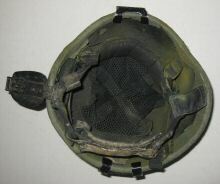 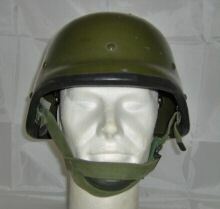 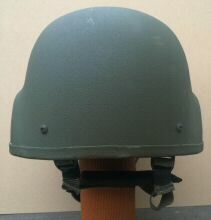 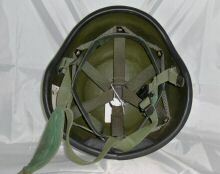 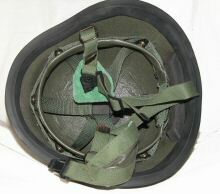 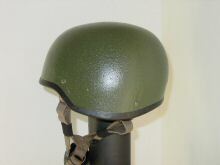 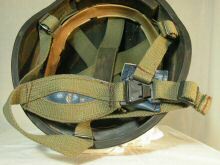 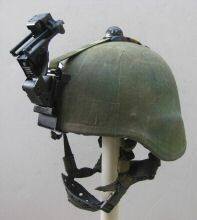 "The green helmet shown here is apparently a version of the SA M87, similar to the one above contributed by Fernando Medina. 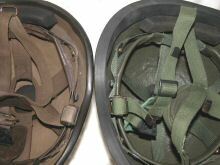 As with Fernando's example there are some differences to the liner and chinstrap compared to the original SA helmet, and the rubber rim around the edge is distinctly thicker than on the SA-issue original. 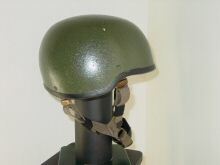 The real difference is the weight; my example of the standard SA-issue helmet (shown here for comparison) weighs 1214 grammes, this green one weighs 1986 g, a substantial and very noticeable increase of almost one and a half pounds - 772g! 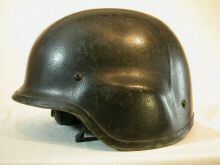 The shell is definately thicker, which would explain the weight gain, but what is this helmet for, for whom was this intended? 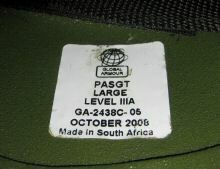 The SA M87 type has been exported to a variety of countries, but for whom was this very heavy example intended or tested? 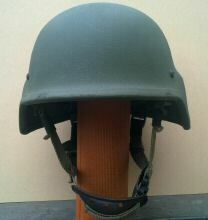 This helmet came from a Belgian eBay seller, who knew nothing about it. 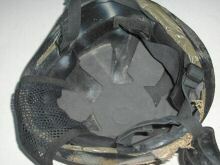 There are no identification marks of any kind within the helmet. 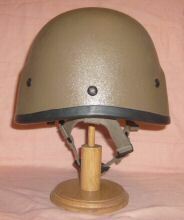 From the colour it may be assumed (perhaps wrongly) that this is a test helmet for a European country. 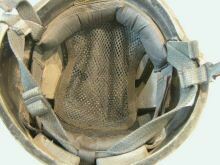 NB - Fernando Medina's example is within the usual weight range of a standard SA-issue helmet." 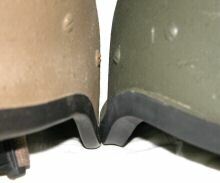 The thickness of the shell is obvious - original SA M87 on left, unusual clone on right. 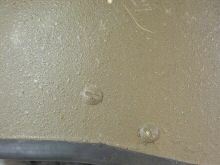 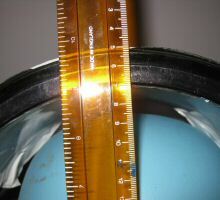 The much heavier rubber rim edging is apparent here. 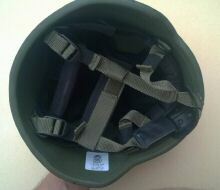 Not known whether this is an issue, export, or 'special forces' helmet. 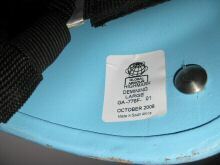 Date on label appears to be June 2003. 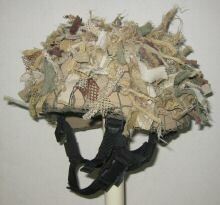 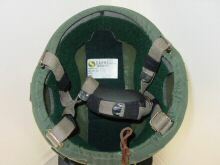 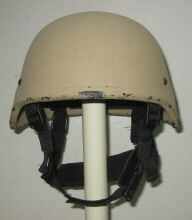 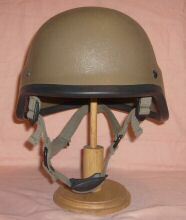 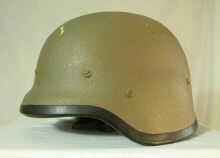 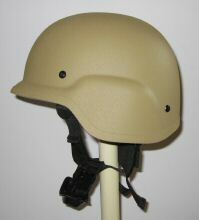 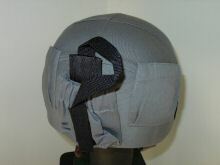 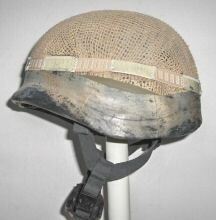 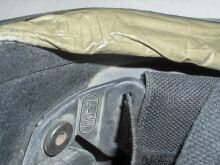 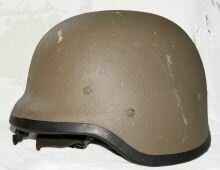 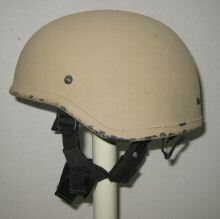 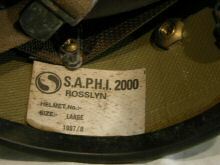 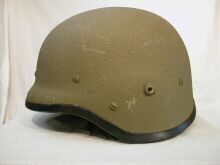 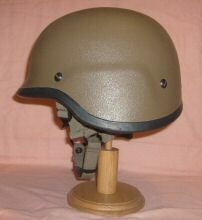 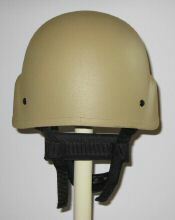 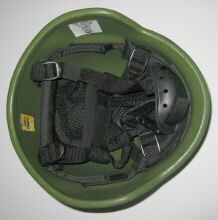 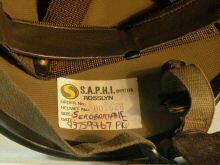 Austrian composite helmet exported to South Africa and used by Special Forces. 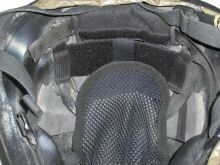 "According to their web site, All Action Wear International (formed 2004) claims to be one of South Africa's most internationally active body armour manufacturers, a market leader in South Africa and the supplier of choice for many government departments and private security companies. 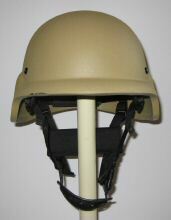 Their “Special Forces Helmet” is the classic PASGT shape and has 3 different types of suspension systems with an integrated nape pad. 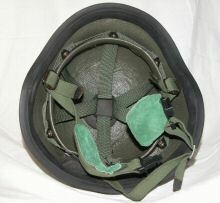 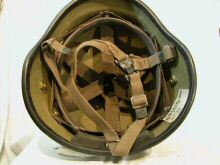 These variants can include leather webbing, plastic chin cups, split leather chin straps etc. 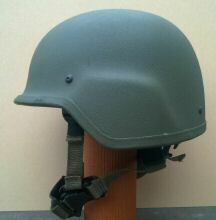 The shells come in Olive Green, Desert Tan, Black, UN Blue, Navy Blue. 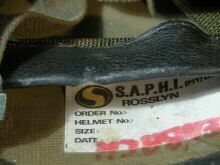 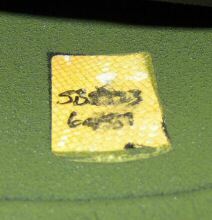 This example is black but has been spray-painted “sand” and looks like it’s been issued/used (although the immaculate label suggests otherwise). 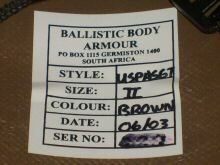 I was told it’s South African-made but used by British Military Forces…..presumably SF as it’s non-standard." 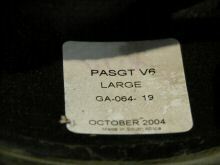 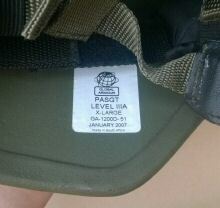 PASGT clone - manufacturer not known. 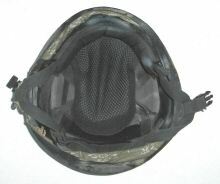 NB - the actual helmet shell is BLACK and the liner/chinstrap either black or very dark grey. 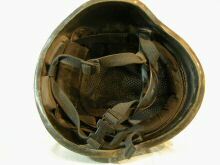 The present photographs do not show this accurately. 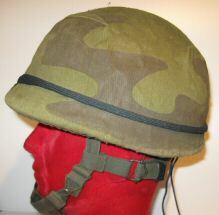 NB - similar model - perhaps the same - shown in the UNITED KINGDOM section. 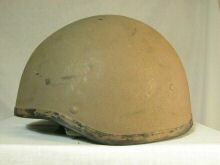 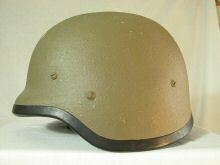 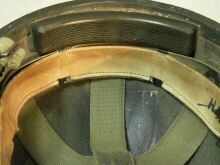 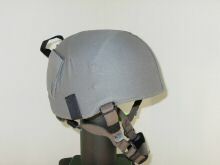 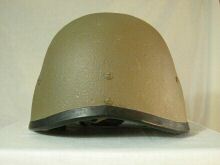 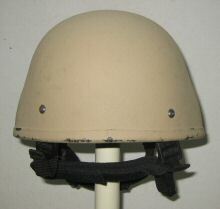 "Classic PASGT-shaped composite helmet from Global Armour originally but now badged "Nexus". 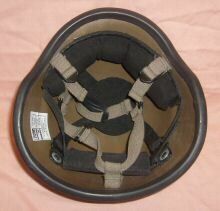 It has the now almost standard black adjustable 4-point harness with shaped chin cup. 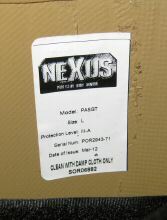 This mint virtually unmarked example is dated 2012 although that's the date on the Nexus label and not necessarily the date of manufacture. 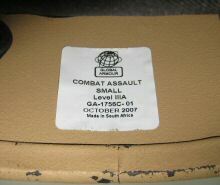 Size - Large - - Weight - 1.5kg"
GLOBAL ARMOUR GA-1200D-51. 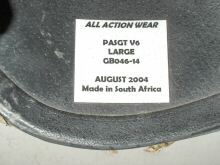 South African manufacture. 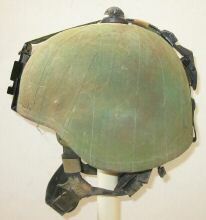 "This is the same shape as their military variant but has a heavy thick visor and 4 large holes in the rear part of the shell. 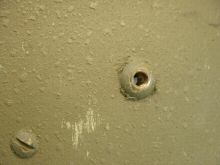 I believe the holes are there for venting any blast should it arise. 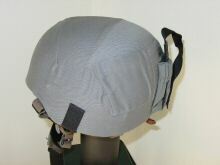 However theories re weight reduction and air-venting could equally be accurate. 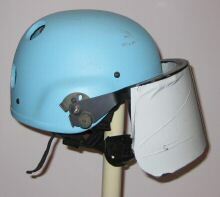 The visor has 2 fixed positions and this one is unissued so it retains its white visor protective cover. 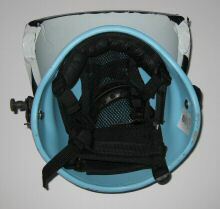 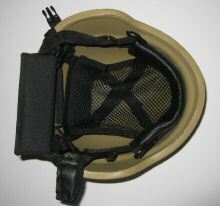 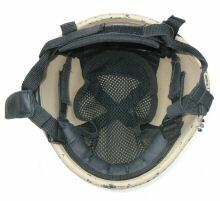 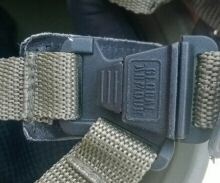 It has the standard GA 4-point harness (Medium in this case) and plastic molded chin cup. 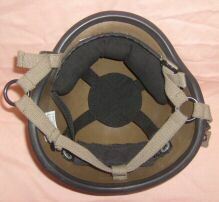 This is a heavy piece of kit which generates considerable pressure on the brow pad of the liner."